Not to be confused with Presidency of the Council of the European Union or President of the European Council. The President of the European Commission is the head of the European Commission, the executive branch of the European Union. The President of the Commission leads a cabinet of Commissioners, referred to as the college, collectively accountable to the European Parliament. The President is empowered to allocate portfolios amongst, reshuffle or dismiss Commissioners as necessary. The college directs the Commission's civil service, sets the policy agenda and determines the legislative proposals it produces (the Commission is the only body that can propose[a] EU laws). The President of the Commission also represents the EU abroad, together with the President of the European Council and the High Representative of the Union for Foreign Affairs and Security Policy. The post was established in 1958. Each new President is nominated by the European Council and formally elected by the European Parliament, for a five-year term. As of 2019[update], the current President is Jean-Claude Juncker, who took office on 1 November 2014. He is a member of the European People's Party (EPP) and is the former Prime Minister of Luxembourg. Juncker is the twelfth President and his First Vice-President is Frans Timmermans. The present Commission was established by the Treaty of Rome in 1957; it also replaced the High Authority and the Commission of Euratom in 1967. The Commission's first president was Walter Hallstein (see Hallstein Commission) who started consolidating European law and began to impact on national legislation. National governments at first took little heed of his administration, with the President having to stamp the Commission's authority early on. With the aid of the European Court of Justice, the Commission began to be taken more seriously. In 1965 Hallstein put forward his proposals for the Common Agricultural Policy, which would give the Community its own financial resources while giving more power to the Commission and Parliament and removing the veto power over Agriculture in the Council. These proposals led to an immediate backlash from France. Hallstein knew the proposals would be contentious, and took personal charge of drafting them, over-riding the Agriculture Commissioner. However he did gain the support of Parliament through his proposals to increase its powers, and he also presented his policy to Parliament a week before he submitted them to the Council. He aimed to demonstrate how he thought the Community ought to be run, in the hopes of generating a wave of pro-Europeanism big enough to get past the objections of member states. However, in this it proved that, despite its past successes, Hallstein was overconfident in his risky proposals. In reaction to Hallstein's proposals and actions, then-French President Charles de Gaulle, who was sceptical of the rising supranational power of the Commission, accused Hallstein of acting as if he were a head of state. France eventually withdrew its representative from the Council, triggering the notorious "empty chair crisis". Although this was resolved under the "Luxembourg compromise", Hallstein became the scapegoat for the crisis. The Council refused to renew his term, despite his being the most 'dynamic' leader until Jacques Delors. Hallstein's work did position the Commission as a substantial power. The presidents were involved in the major political projects of the day in the 1970s, such as the European Monetary Union. In 1970, President Jean Rey secured the Community's own financial resources and in 1977, President Roy Jenkins became the first Commission President to attend a G7 summit on behalf of the Community. However, owing to problems such as the 1973 oil crisis and the 1979 energy crisis, economic hardship reduced the priority of European integration, with only the President trying to keep the idea alive. The member states had the upper hand, and they created the European Council to discuss topical problems, yet the Council was unable to keep the major projects on track such as the Common Agricultural Policy. The Community entered a period of eurosclerosis, owing to economic difficulties and disagreements on the Community budget, and by the time of the Thorn Commission the President was unable to exert his influence to any significant extent. However, the Commission began to recover under President Jacques Delors' Commission. He is seen as the most successful President, being credited with having given the Community a sense of direction and dynamism. The International Herald Tribune noted the work of Delors at the end of his second term in 1992: "Mr. Delors rescued the European Community from the doldrums. He arrived when Europessimism was at its worst. Although he was a little-known (outside France) finance minister and former MEP, he breathed life and hope into the EC and into the dispirited Brussels Commission. In his first term, from 1985 to 1988, he rallied Europe to the call of the single market, and when appointed to a second term he began urging Europeans toward the far more ambitious goals of economic, monetary and political union." But Delors not only turned the Community around, he signalled a change in the Presidency. Before he came to power, the Commission President still was a position of first among equals; when he left office, he was the undisputed icon and leader of the Community. His tenure had produced a strong Presidency and a strong Commission as the President became more important. Following treaties cemented this change, with the President being given control over the allocation of portfolios and being able to force the resignation of Commissioners. When President Romano Prodi took office with the new powers of the Treaty of Amsterdam, he was dubbed by the press as Europe's first Prime Minister. President Delors' work had increased the powers of Parliament, whose support he had enjoyed. However, later Commissions did not enjoy the same support, and in 1999, the European Parliament used its powers to force the Santer Commission to resign. Historically, the Council appointed the Commission President and the whole body by unanimity without input from Parliament. However, with the Treaty on European Union in 1993, the European Parliament, the body elected directly by the citizens of the European Union, gained the right to be 'consulted' on the appointment of the President and to veto the Commission as a whole. Parliament decided to interpret its right to be consulted as a right to veto the President, which the Council reluctantly accepted This right of veto was formalised in the Amsterdam Treaty. The Treaty of Nice changed the Council's vote from a unanimous choice to one that merely needed a qualified majority. This meant that the weight of the Parliament in the process increased resulting in a quasi-parliamentary system where one group could be 'in government'. This became evident when numerous candidates were put forward in 2004, and a centre-right vote won out over left-wing groups, France and Germany. José Manuel Barroso, elected Commission President that year, was then forced to back down over his choice of Commissioners, owing to Parliament's threat that it would not approve his Commission. In 2009, the European People's Party endorsed Barroso as its candidate for Commission President, and the EPP subsequently retained its position as largest party in that year's election. The Socialists responded by pledging to put forward a rival candidate at future elections. Once again, Barroso was forced by Parliament to make a change to his proposed Commission, but eventually received assent. However, in exchange for approval, Parliament forced some concessions from Barroso in terms of Parliamentary representation at Commission and international meetings. On 7 September 2010, Barroso gave the first US-style State of the Union address to Parliament; which focused primarily on the EU's economic recovery and human rights. The speech was to be annual. Article 17 of the Treaty on European Union, as amended by the Treaty of Lisbon, lays out the procedure for appointing the President and his team. The European Council votes by qualified majority for a nominee for the post of President, taking account of the latest European elections. This proposal is then put before Parliament which must approve or veto the appointment. If an absolute majority of MEPs support the nominee, he/she is elected. The President then, together with the Council, puts forward his team to the Parliament to be scrutinised. The Parliament normally insists that each one of them appear before the parliamentary committee that corresponds to their prospective portfolio for a public hearing. The Parliament then votes on the Commission as a whole; if approved, the European Council, acting by a qualified majority, appoints the President and his team to office. Qualified majority in the Council has led to more candidates being fielded while there has been greater politicisation due to the involvement of Parliament and the change of policy direction in the EU from the creation of the single market to reform of it. However, despite this, the choice within the Council remains largely behind closed doors. During the appointment of Santer, discussions were kept in camera (private), with the media relying on insider leaks. MEPs were angry with the process, against the spirit of consultation that the new EU treaty brought in. Pauline Green MEP, leader of the Socialist group, stated that her group thought "Parliament should refuse to condone a practice which so sullies the democratic process". There were similar deals in 1999 and 2004 saw a repeat of Santer's appointment when Barroso was appointed through a series of secret meetings between leaders with no press releases on the negotiations being released. This was sharply criticised by MEPs such as the ALDE group leader Graham Watson who described the procedure as a "Justus Lipsius carpet market" producing only the "lowest common denominator"; while Green-EFA co-leader Daniel Cohn-Bendit asked Barroso after his first speech "If you are the best candidate, why were you not the first?" The candidate selected by the Council has often been a leading national politician, but this is not a requirement. The choice of President must take into account the result of the latest Parliamentary elections (i.e. the candidate supported by the victorious European political party in particular, or at least someone from that political family[according to whom?]). That provision was not in force in the nomination in 2004, but the centre-right European People's Party (EPP), which won the elections, pressured for a candidate from its own ranks. In the end, the EPP candidate, José Manuel Barroso was chosen. On the same basis, the EPP endorsed again Barroso for a second term during the 2009 European elections campaign and, after winning again the elections, was able to secure his nomination by the European Council. Further criteria seen to be influencing the choice of the Council include: which area of Europe the candidate comes from, favoured as Southern Europe in 2004; the candidate's political influence, credible yet not overpowering members; language, proficiency in French considered necessary by France; and degree of integration, their state being a member of both the eurozone and the Schengen Agreement. 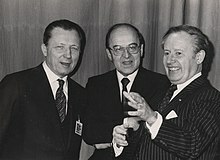 There is an assumption that there is a rolling agreement along these lines that a president from a large state is followed by a president from a small state, and one from the political left will be followed by one from the political right: Roy Jenkins (British socialist) was followed by Gaston Thorn (Luxembourgish liberal), Jacques Delors (French socialist), Jacques Santer (Luxembourgish Christian democrat), Romano Prodi (Italian left-wing Christian democrat) and Jose Barroso (Portuguese Christian democrat). However, despite these assumptions, these presidents have usually been chosen during political battles and coalition-building. Delors was chosen following a Franco-British disagreement over Claude Cheysson, Santer was a compromise after Britain vetoed Jean-Luc Dehaene, and Prodi was backed by a coalition of thirteen states against the Franco-German preference for Guy Verhofstadt. In February 2008, President Barroso admitted that despite the President having in theory as much legitimacy as heads of governments, in practice it was not the case. The low voter turnout creates a problem for the President's legitimacy, with the lack of a "European political sphere", but analysts claim that if citizens were voting for a list of candidates for the post of President, turn out would be much higher than that seen in recent years. Under the Treaty of Lisbon the European Council has to take into account the results of the latest European elections and, furthermore, the Parliament elects, rather than simply approve, the Council's proposed candidate. This was taken as the parliament's cue to have its parties run with candidates for the President of the Commission with the candidate of the winning party being proposed by the Council. This was partly put into practice in 2004 when the European Council selected a candidate from the political party which secured a plurality of votes in that year's election. However at that time only a minor party had run with a specific candidate: the then fourth placed European Green Party, who had the first true pan-European political party with a common campaign, put forward Daniel Cohn-Bendit and lost even their fourth place in the following election becoming only the fifth largest group in 2009 and diminishing their candidate's chances further. However the winning European People's Party only mentioned four or five people as candidates for President. There have been plans to strengthen the European political parties in order for them to propose candidate for future elections. The European Liberal Democrat and Reform Party indicated, in its October 2007 congress, its intention to forward a candidate for the post as part of a common campaign but failed to do so. However the European People's Party did select Barroso as their candidate and, as the largest party, Barroso's turn was renewed. The Socialists, disappointed at the 2009 election, agreed to put forward a candidate for Commission President at all subsequent elections. After a campaign within that party to have open primaries for said candidate, the PES Congress gathering in Brussels in November 2011 decided that PES would designate its candidate for Commission president through primaries took place in January 2014 in each of its member parties and organisations, before a ratification of the results by an Extraordinary PES Congress in February 2014. For the first time, prior to the 2014 election presidential candidates were nominated. This enabled them to present election programmes and campaign for the position (the campaign bus of Jean-Claude Juncker depicted). The Spitzenkandidat (German for "Lead Candidate") process is the method of linking European Parliament elections by having each major political group in Parliament nominating their candidate for Commission President prior to the Parliamentary elections. The Spitzenkandidat of the largest party would then have a mandate to assume the Commission Presidency. This process was first run in 2014 and its legitimacy was contested by the Council. According to the treaties, the President of the European Commission is nominated by the European Council. Until 2004, this nomination was based on an informal consensus for a common candidate. But in 2004 the centre-right European People's Party rejected the consensus approach ahead of the European Council meeting and pushed through their own candidate, Barroso. The approach of national governments was to appoint the various high-profile jobs in EU institutions (European Council President, High Representative and so on) dividing them according along geographic, political and gender lines. This also led to fairly low-profile figures in some cases, for it avoided candidates who had either made enemies of some national governments or who were seen as potentially challenging the Council or certain member states. Taking into account the elections to the European Parliament and after having held the appropriate consultations, the European Council, acting by a qualified majority, shall propose to the European Parliament a candidate for President of the Commission. In 2013, in preparation for the European elections of 2014, Martin Schulz, then President of the European Parliament campaigned for European political parties to name lead candidates for the post of President of the European Commission; his own party group, the centre-left Party of European Socialists named Schulz as their lead candidate (German: Spitzenkandidat). The European People's Party held an election Congress in Dublin, where Jean-Claude Juncker beat his rival Michel Barnier and subsequently ran as EPP's lead candidate. The Alliance of Liberals and Democrats for Europe Party and the European Green Party also selected lead candidates. The Alliance of European Conservatives and Reformists, did not name a candidate, objecting to the principle of Spitzenkandidaten and its "tenuous" basis in law. The German term for lead candidates caught on, and they became known informally as Spitzenkandidaten. The European People's Party won a plurality (29%) in the 2014 elections, and Jean-Claude Juncker, its lead candidate, was appointed as president by the European Council. British Prime Minister David Cameron and Hungarian Prime Minister Viktor Orbán were the only members of the council to object to his selection. Some commentators argued that this amendment did not entitle the political parties of the Parliament to nominate candidates for the president of the Commission, and that such an interpretation would amount to a "power grab" at the expense of the European Council. The Council found itself taken off guard by how the process took off, and had backed themselves into a corner in having to approve the Parliament's candidate. Following the appointment, leaders vowed to review the process. It has also been argued that it is still insufficiently democratic and needs to be replaced with a more direct system. Some suggestions toward this have been electing the President via a transnational list, having a direct election, and holding primary elections. Parliamentary proposals to enact some of these in advance of the 2019 election have been opposed by some in the Council. The President is elected for a renewable five-year term starting five months after the elections to the European Parliament. These were brought into alignment via the Maastricht Treaty (prior to which the Commission had a four-year term of office) and the elections take place in June every five years (in years ending in 4 and 9). This alignment has led to a closer relationship between the elections and the President himself with the above-mentioned proposals for political parties running with candidates. The President and his Commission may be removed from office by a vote of censure from Parliament. Parliament has never done this to date, however the imminence of such a vote in 1999, due to allegations of financial mismanagement, led to the Santer Commission resigning on its own accord, before the Parliamentary vote. The President of the European Commission is the most powerful position in the European Union, controlling the Commission which collectively has the right of initiative on Union legislation (only on matters delegated to it by member states for collective action, as determined by the treaties) and is responsible for ensuring its enforcement. The President controls the policy agenda of the Commission for his term and in practice no policy can be proposed without the President's agreement. The role of the President is to lead the Commission, and give direction to the Commission and the Union as a whole. The treaties state that "the Commission shall work under the political guidance of its President" (Article 219 TEC), this is conducted through his calling and chairing of meetings of the college of Commissioners, his personal cabinet and the meetings of the heads of each commissioner's cabinet (the Hebdo). The president may also force a Commissioner to resign. The work of the Commission as a body is based on the principle of Cabinet collective responsibility, however in his powers he acts as more than a first among equals. The role of the President is similar to that of a national Prime Minister chairing a cabinet. The President also has responsibility for representing the Commission in the Union and beyond. For example, he is a member of the European Council and takes part in debates in Parliament and the Council of Ministers. Outside the Union he attends the meetings of the G8 to represent the Union. However, in foreign affairs, he does have to compete with several Commissioners with foreign affairs related portfolios: the High Representative for the Common Foreign and Security Policy and the President of the European Council. The Presidential system had started to develop since Jacques Delors and has since been cemented. However, externally he is still dependent on support from the Council and Parliament. Delors had enjoyed the Parliament's and the Council's support for his whole term, during which, through treaty changes, the Parliament increased in powers and, through the accession of new Member States, the Council increased in membership. The membership is now so large the President is increasingly unable to garner the support of all the states, even though the job is supposed to try to keep everyone happy. The Parliament now has more powers over the Commission and can reject its proposals, although the Commission has little power over Parliament, such as the ability to dissolve it to call new elections. The President's office is on the top, 13th, floor of the Berlaymont building in Brussels. The president receives his political guidance from his cabinet, the head of which acts as a political bodyguard for the President. Such factors can lead to an isolation of the President from outside events. For the European Civil Service the President has a very high status, due to his immense authority and symbolism within the body. The President exercises further authority through the legal service and Secretariat-General of the Commission. The former has the power to strike down proposals on legal technicalities while the latter organises meetings, agendas and minutes. His control over these areas gives the President further political tools when directing the work of the Commission. This has also increased the Presidential style of the Commission President. With the reorganisation of leading EU posts under the Lisbon Treaty, there was some criticism of each posts vague responsibilities. Ukrainian ambassador to the EU Andriy Veselovsky praised the framework and clarified it in his own terms: The Commission President speaks as the EU's "government" while the President of the European Council is a "strategist". The High Representative specialises in "bilateral relations" while the European Commissioner for Enlargement and European Neighbourhood Policy deals in technical matters such as the free trade agreement with Ukraine. The President of the European Parliament meanwhile articulates the EU's values. The MEP and author of several EU text books Richard Corbett has suggested that, instead of every EU institution having a "President", it would have been clearer if they had been named differently, with a "Speaker" of the Parliament, a "Governor" of the Central Bank, a "Chairman" of the (ordinary) Council of Ministers, a "President" of the European Council - and a "Prime Commissioner". Despite the recent presidential style, the president has also begun to lose ground to the larger member states as countries such as France, Italy, the UK and Germany seek to sideline its role. This may increase with the recent creation of the permanent President of the European Council. There has been disagreement and concern over competition between the President of the European Council Van Rompuy and the Commission President Barroso due to the vague language of the treaty. Some clarifications see Van Rompuy as the "strategist" and Barroso as a head of government. In terms of economic planning Van Rompuy saw the Commission as dealing with the content of the plan and the European Council as dealing with the means and implementing it. Despite weekly breakfasts together there was a certain extent of rivalry between the two, as well as with the High Representative. At international summits, both Presidents go at the same time to represent the Union, with, in principle, the Commission President speaking on economic questions and the European Council President on political questions, although this division is often hard to maintain in practice. Although there are concerns that this competition with the new European Council President would lead to increased infighting, there are provisions for combining the two offices. The European Council President may not hold a national office, such as a Prime Minister of a member state, but there is no such restraint on European offices. So the Commission President, who already sits in the European Council, could also be appointed as its president. This would allow the European Council to combine the position, with its powers, of both executive bodies into a single President of the European Union. The basic monthly salary of the President is fixed at 138% of the top civil service grade which, in 2013, amounted to €25,351 per month or €304,212 per year plus an allowance for a residence equal to 15% of salary as well as other allowances including for children's schooling and household expenses. This section firstly presents a lists over presidents of the three executives that were merged in 1967 following the Merger Treaty, namely the High Authority of the European Coal and Steel Community (from 1952), and the commissions of the European Atomic Energy Community and the European Economic Community (both from 1958). Secondly, a list is given over the presidents after the merger, when the single position presided over the Commission of the European Communities, until 2009 when the Treaty of Lisbon renamed of the institution, creating the President of the European Commission. Monnet resigned on Europe day 1955 following the failure of the European Defence Community. Hallstein Commission comprised nine members (two each from France, Italy and Germany, one each from Luxembourg, Belgium and the Netherlands). It was faced with a formidable array of tasks. These tasks included the implementation of a customs union and "the Four Freedoms", as well as common policies on competition, trade, transport and agriculture. Though Hallstein's own vision of a federal Europe was clear, the EEC treaty left many questions open. The European Economic Community was established by the Treaty of Rome, presently known as the Treaty on the Functioning of the European Union; a founding treaty of the union, which explains that the enumeration of presidents which ends with the present position starts with the first President of the Commission of the European Economic Community. The European Union is also the legal successor of the European Economic Community, or the European Community as it was named between 1993 and 2009. The establishment of the European Union in 1993 upon the entry into force of the Maastricht Treaty (formally the Treaty on European Union) did not affect the name of the position. Still a convinced federalist, he undertook to reinforce the Community institutions. He won increased powers for the European Parliament and advocated its election by universal suffrage. During his presidency, he oversaw the completion of the customs union. He also played an important role the Summit of The Hague in 1969, where the European leaders decided to relaunch European integration with two new initiatives: on the one hand, Economic and Monetary Union of the European Union (EMU), and on the other hand, European Political Cooperation (EPC), which foreshadow the euro and the Common Foreign and Security Policy of the European Union today. The Malfatti Commission began as the integration process was relaunched: the EC adopting a financial framework and competing the single market. There was also the beginnings of political cooperation, monetary cooperation and of enlargement as talks opened with Denmark, Ireland, Norway and the United Kingdom. He resigned from this post in 1972 to run for office in Italy. Mansholt became President of the European Commission on 22 March 1972, and continued in that position until 5 January 1973. It was around that time he was heavily under the influence of Club of Rome. The Ortoli Commission affronted the oil crisis of 1973 and the soaring prices of black gold. Ortoli, the first and last Gaullist President of the Commission, was one of the main architects of the foundation of the European Monetary System (SME) and the European Currency Unit (ECU). The main development overseen by the Jenkins Commission was the development of the Economic and Monetary Union of the European Union from 1977, which began in 1979 as the European Monetary System, a forerunner of the Single Currency or Euro. President Jenkins was the first President to attend a G8 summit on behalf of the Community. Jenkins remained in Brussels until 1981, contemplating the political changes in the UK from there. During his Commission, there were the first European parliamentary elections in 1979. In 1980 Thorn was chosen as President of the Commission of the European Communities (now called the European Union), in succession to Roy Jenkins. He took office on 12 January 1981. He was seen as very close to the President of France, Valéry Giscard d'Estaing, and generally as a defender of French interests in European politics. Although Thorn was not considered a very forceful Commission President, during his term of office the Commission continued to expand its power, both at the expense of the national governments of EC members, and of the European Parliament, with which the Commission engaged in a constant power struggle. During his presidency, Delors oversaw important budgetary reforms and laid the groundwork for the introduction of a single market within the European Community, which came into effect on 1 January 1993. In the autumn of 1988 Delors addressed the British Trade Union Congress, promising that the EC would be a force to require governments to introduce pro-labour legislation. His long tenure also included the signing of the Schengen Agreement (1985), enlargement of the European Community (Spain and Portugal joined in 1986), adoption of the Single European Act (1986), reform of the Common Agricultural Policy (associated with the creation of the European Programme of Aid to the Poorest, and the signing of the Maastricht Treaty (1992), which marked the transition of the EC to the European Union (1993). As an attempt to strengthen the European Executive, Jacques Delors's Third Commission represented the European Community at major international summits (G7 and OCDE meetings, etc.). Delors also inspired the White paper. Santer became the ninth President of the European Commission in 1995 as a compromise choice between the United Kingdom and a Franco-German alliance, after the Franco-German nominee Jean-Luc Dehaene was vetoed by British prime minister John Major. Allegations of corruption concerning individual EU-commissioners led to an investigation into administrative failings (incompetence and malpractice) by an independent group of experts. Santer Commission resigned after the corruption scandal. Interim President after the Santer Commission's corruption scandal. Prodi, a strong supporter of European Integration, became President of the European Commission thanks to the support of both the conservative European People's Party and social-democratic Party of European Socialists in the European Parliament. It was during Prodi's presidency, in 2002, that eleven EU member states abandoned their national currencies and adopted the Euro as their single currency. This commission saw in increase in power and influence following Amsterdam Treaty. In 2004 the EU was enlarged to admit several more member nations, most formerly part of the Soviet bloc. As well as the enlargement and Amsterdam Treaty, the Prodi Commission also saw the signing and enforcement of the Treaty of Nice as well as the conclusion and signing of the European Constitution. During his first presidency, the following important issues were on the Commission's agenda: Turkey applying for EU membership, the reform of the institutions (Treaty of Lisbon), the Bolkestein directive, aimed at creating a single market for services within the EU, Lisbon Strategy, Galileo positioning system, Doha Development Agenda negotiations, European Institute of Innovation and Technology, and an EU climate change package. Upon its entry into force in 2009, the Treaty of Lisbon renamed the Commission of the European Communities the European Commission, reflecting the de facto name as well as the fact that the European Communities pillar was abolished along with the rest of the pillar system. In 2012 Barroso called for the EU to evolve into a "federation of nation-states". Addressing the EU parliament in Strasbourg, Barroso said he believed Greece would be able to stay in the eurozone if it stood by its commitments. Barroso also set out plans for a single supervisory mechanism for all banks in the eurozone. European migrant crisis. Elections in Greece, Poland, Austria, Czech Republic, Hungary and Italy result in increased support for Nationalist/Populist parties. The United Kingdom votes to leave the European Union. ^ "European Commission salaries" (PDF). European Voice. Politico (Supplement: The Companion to the European Commission): 56. February 2015. Retrieved 19 June 2015. ^ "European Commission". CVCE. Retrieved 4 May 2013. ^ Eppink 2007, pp. 221–2. ^ a b "The 'empty chair' policy". CVCE. Retrieved 4 May 2013. ^ a b Ludlow, N (2006). "De-commissioning the Empty Chair Crisis : the Community institutions and the crisis of 1965–6" (PDF). London School of Economics. Archived from the original (PDF) on 25 October 2007. Retrieved 24 September 2007. ^ Eppink 2007, p. 222. ^ "The Rey Commission". Europa (web portal). Retrieved 10 February 2008. ^ "EU and the G8". European Commission. Archived from the original on 26 February 2007. Retrieved 25 September 2007. ^ Eppink 2007, pp. 222–3. ^ Eppink 2007, p. 24. ^ "The new Commission – some initial thoughts". Burson-Marsteller. 2004. Archived from the original on 25 September 2007. Retrieved 17 June 2007. ^ Merritt, Giles (21 January 1992). "A Bit More Delors Could Revamp the Commission". International Herald Tribune. Archived from the original on 21 January 2008. Retrieved 17 October 2007. ^ James, Barry (16 April 1999). "Prodi to Have Wide, New Powers as Head of the European Commission". International Herald Tribune. Archived from the original on 17 October 2007. Retrieved 17 June 2007. ^ Rossant, John (27 September 1999). "Commentary: Romano Prodi: Europe's First Prime Minister? (int'l edition)". Business Week. Retrieved 17 June 2007. ^ Eppink 2007, p. 228. ^ "European Parliament". European NAvigator. Retrieved 5 August 2017. ^ Hix 2008, pp. 37–8. ^ Hix 2008, p. 38. ^ Hix 2008, p. 39. ^ a b Phillips, Leigh (12 August 2010). "Socialists want US-style primaries for commission president candidate". EU Observer. Retrieved 12 August 2010. ^ Hix 2008, p. 157. ^ Hix 2008, p. 158. ^ Hix 2008, p. 159. ^ Cohn-Bendit, Daniel (2004). "Nomination of Commission President handled "in a most unsatisfactory way"". European Parliament. Archived from the original on 29 August 2007. Retrieved 1 July 2007. ^ Watson, Graham (21 July 2004). "Statement by the President-designate of the Commission". Graham Watson MEP website. Retrieved 1 July 2007. ^ "Barroso Appointed EU Commission President". Deutsche Welle. 30 June 2004. Retrieved 27 June 2014. ^ Fuller, Thimas (30 June 2004). "Portuguese premier wants to unite bloc : Barroso nominated to head EU executive". International Herald Tribune. Archived from the original on 4 June 2011. Retrieved 1 July 2007. ^ Stuart, Paul (21 July 2004). "Portugal's Prime Minister Barroso nominated as European Commission president". World Socialist Web Site. Archived from the original on 11 March 2011. Retrieved 1 July 2007. ^ "José Manuel Durão Barroso: The New Commission President". Grayling. 2004. Archived from the original on 29 September 2007. Retrieved 1 July 2007. ^ Hix 2008, p. 156. ^ Mahony, Honor (28 February 2008). "Barroso admits legitimacy problem for commission president post". EU Observer. Retrieved 29 February 2008. ^ a b Hughes, Kirsty. "Nearing Compromise as Convention goes into Final Week?" (PDF). EPIN. Archived from the original (PDF) on 27 February 2008. Retrieved 30 January 2008. ^ "European Greens Found European Greens". Deutsche Welle. 23 February 2004. Retrieved 30 January 2008. ^ "The EP elections: Deepening the democratic deficit". Euractiv. 16 June 2004. Retrieved 27 July 2007. ^ Mahony, Honor (27 June 2007). "European politics to get more political". EU Observer. Retrieved 28 June 2007. ^ Palmer, John (10 January 2007). "Size shouldn't matter". The Guardian. UK. Retrieved 28 June 2007. ^ "Leadership of the EU". Federal Union. Archived from the original on 9 June 2007. Retrieved 27 August 2007. ^ Janning, Josef (1 July 2014). "Five lessons from the "Spitzenkandidaten" European Parliament campaign". European Council on Foreign Relations. Archived from the original on 9 August 2014. Retrieved 8 August 2014. ^ "Syed Kamall: new leader of European Conservatives and Reformists". European Parliament. 30 June 2014. Retrieved 8 August 2014. ^ "EU backs Juncker to head Commission in blow to UK". BBC. 27 June 2014. Retrieved 1 April 2016. ^ a b c d e f "Role and Powers". Europa (web portal). Retrieved 10 January 2008. ^ a b c d e Hix 2008, p. 155. ^ "Institutions of the EU: The European Commission". Europa (web portal). Archived from the original on 23 June 2007. Retrieved 18 June 2007. ^ Eppink 2007, pp. 232–3. ^ Eppink 2007, pp. 226–8. ^ Eppink 2007, pp. 211–3. ^ Eppink 2007, p. 211. ^ Eppink 2007, pp. 217–21. ^ Iey Berry, Peter Sain (18 January 2008). "[Comment] Power is, according to some observers, slipping from the Commission to the European Council". EU Observer. Retrieved 18 January 2008. ^ Duff, Andrew (23 February 2010) Who is Herman Van Rompuy? ^ Hix, Simon; Roland, Gérard. "Why the Franco-German Plan would institutionalise 'cohabitation' for Europe". Foreign Policy Centre. Retrieved 1 October 2007. ^ "SCADPlus: The Institutions of the Union: European Council". Europa (web portal). Archived from the original on 21 December 2009. Retrieved 27 June 2007. ^ "Bureaucracy's Salaries Defended in Europe". New York Times. 4 February 2014. Retrieved 9 June 2014. ^ Santer resigned before his mandate expired. His commission served in caretaker capacity under Marín till September. Replaced by Prodi, who completed Santer's mandate to 22 January 2000, when they were reappointed on their own mandate. Eppink, Derk-Jan (2007). Life of a European Mandarin: Inside the Commission. Translated by Connerty, Ian (1st ed.). Tielt, Belgium: Lannoo. ISBN 978-90-209-7022-7. Hix, Simon (2008). What's wrong with the EU and how to fix it. Cambridge, United Kingdom: Polity. ISBN 978-0-7456-4205-5.